Walking in over a nice point. Nothing can approximate the anticipation of the flush, to the truly addicted. 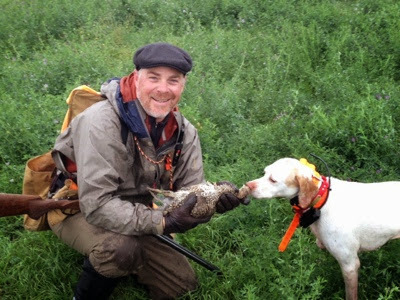 The end result of the years of training and bonding is a harvested game bird. Of course, that is merely the physical outcome. The psychological result and benefits, for the dog and gunner, are incalculable. 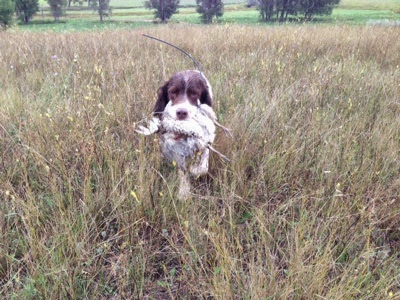 My 9.5 year old main man, Ace, retrieving a Sharptail Grouse to hand. Things only get better with age. 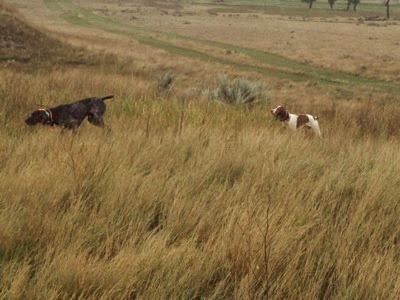 Shack, 12 months old, (right), is getting a lesson from Pepper over a Sharptail Grouse, on the prairie of Montana. This was a cold, wet day and a hunters dream. 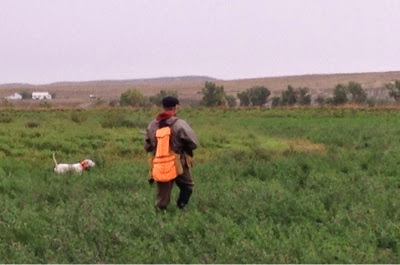 Lots of birds, easy access and good dogs, young dogs. Today, it will still be cold, but perhaps not so wet. My other dogs issued the ultimatum, "Play Us or Trade Us, Boss!" I'm starting to hear the rumblings of discontent from the back of the truck.